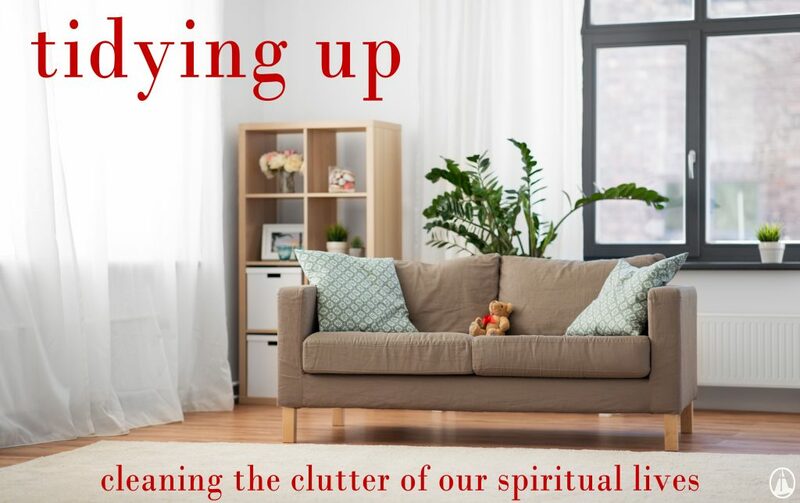 As we turned the calendar to 2019, many of us, spurred on by Marie Kondo, took the time to reorganize and de-clutter. It is amazing how quickly our lives become chaotic and messy. But what about our spiritual lives? Shouldn’t we give the same attention to making sure we have room for God? 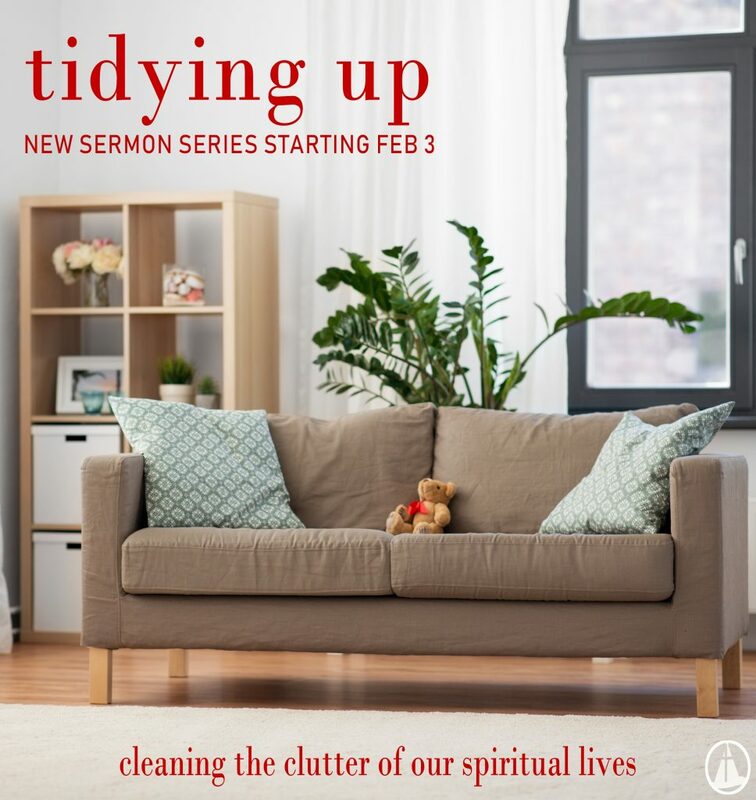 Join us starting February 3rd as we explore ways to clean the clutter of our spiritual lives, making room for Christ and his call. A remarkable thing happens at Jesus’ birth – the world comes to see. And not just see, but to have and to hold. In ancient times, all things holy were kept at a distance. Everyone except the priests and the Levites had to stay two thousand cubits (about three thousand feet) from the ark of the covenant of the Lord. It was the place where God’s Spirit dwelled, holy, sacred, set apart. In those times, God spoke directly to Moses, but no others. But then Christ came to the people. All the old rules of keeping distance between God and humankind were broken. A hymn we sing that always takes my breath away contains the refrain: taste and see, the Lord is good. On it surface it makes no sense. God accessible. Good with evil. The perfect in the midst of the flawed. But he has come to show us a new way, a way of forgiveness and life. We are invited to draw near to him. He promises to draw near to us. We live in a messy world. Sometimes it is difficult to know whether to respond to a situation with grace or with firmness, with the gospel or with law. For example, how many times have you been asked for money on the street? In an instant you have to decide what to do, give, or hold back. If you give there is the risk your money will be misused, if you hold back, you risk losing an opportunity help meet a real need. If you are like me, you have responded various ways, at various times, depending on many factors. Being asked for money on the street is a relatively simple example of living Jesus’ call in a complex world. Perhaps it helps to know that Jesus had to make these decisions as well. Reading this passage again, it struck me, not only was Judas the one who would ultimately betray his Lord with a kiss, but for much of the time he was with Jesus, he also had a habit of stealing from the shared resources of the group. He was a thief. He helped himself to their money, money which at least some portion thereof, would be given out to help the poor. Yet Jesus allowed Judas to stay. He chose grace when dealing with Judas, in spite of all he did, and would do. Why? We cannot know for sure. Maybe Jesus hoped, and prayed, that abundant grace might be the thing, the only thing that could win Judas over. Certainly it wasn’t because Jesus was scared of conflict. Jesus was often firm, instructing others to turn from sin and repent. Or, perhaps, Judas was allowed to go on stealing as one more cautionary tale – beware the danger of loving money, it can lead to a multitude of sins. While we do not know the entire story of Jesus’ interactions with Judas, I am convinced that this is a good example of what He meant when he advised his followers to be shrewd and innocent. Living in a messy, broken world, God’s people have to make decision all the time when responding to difficult situations. As Jesus teaches, we hope to be shrewd and not naive, careful and sometimes cautious. But we are also called to be people of abundant grace, avoiding judgement, bias, and prejudice, sometimes loving through, and in spite of, the sin in the lives of those we care about. Certainly many parents have had to wade through these waters when trying to love their children well. Firmness – grace; law – gospel; shrewd – innocent. We pray Jesus would send his Spirit to grant us discernment as we follow him through this messy world. Dear Calvary Friends, with significant accumulating snow overnight, and expected to continue this morning, we have made the decision to CANCEL all Sunday activities at Calvary today. We do not want any of our leaders, servers, or attendees to feel they need to travel with difficult road conditions. Please stay safe, enjoy a snowy day, and we will see you next Sunday. 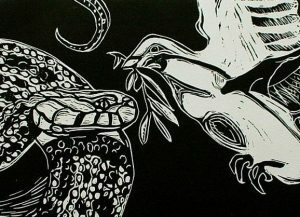 If you would like to take some time this morning to reflect on the readings of the day, you can find them at this Revised Common Lectionary Site, provided by Vanderbilt Divinity. 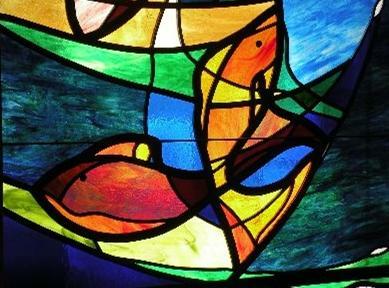 Prayers, and reflections on the daily theme, are also provided as links on the right-hand side of the page. Today is the celebration of the Baptism of our Lord. We give thanks to God for Jesus own baptism at the hand of John, and ask that God would daily make us new through baptism as well, that we might be assured of forgiveness, and be cleansed for new life in Christ.